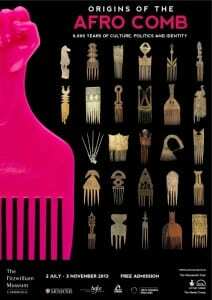 The comb is an object with many different forms and values which often go beyond the actual function, sometimes associated with cultural affiliation, protection and status. These combs are all similar but in themselves unique, and I promise that each and every one of you entering this exhibition will gain a favourite comb but also a fascination for the subject. To me these combs have a great interest when it comes to their materials of construction and use. As I am the main conservator for this project, my role has been to carry out technical analysis of materials, as well as the condition checking and conservation work needed to enable the safe display of these objects. As a conservator I am able to reveal details about objects which sometimes make the previous owners somewhat visible. On combs I have seen the signs of use like hair but also residues of oil/fat/wax which may be remnants of hair dressings or similar that may have cultural significance. I have also observed the careful choice of materials and attention to detail devoted to the creator; to make sure that the object will be fit for function whatever it may be. The exhibition is the result of a joint effort between The Fitzwilliam Museum and the Museum of Archaeology & Anthropology, Cambridge. The exhibition also has multiple partners including the Petrie Museum where workshops and talks have been held relating to hair and combs. An upcoming event is a workshop held on the 30th October at the Petrie Museum and is called ‘DISCOVER THE SECRETS OF THE AFRO COMB’. Here you can take a trail around the Museum to explore objects related to hair and hairstyling from Ancient Egypt. It is apparent that this exhibition is ground-breaking and very much worth seeing, but another reason to see this exhibition is that it provides a unique opportunity to see 28 combs from the Petrie collection which shows pieces not generally seen in the Museum. To pay tribute to this exhibition we’ve also got a special new display in the Petrie Museum, showing additional Egyptian Combs from the Roman Period. Pia Edqvist is a Museum Assistant at the Petrie Museum, where she focuses on conservation projects. Goodness, I didn’t realise the fist comb had any political significance at all. Shame I’ve missed this exhibition, it would definitely have been worth seeing. Great article, thanks.